S I G N & D I G I T A L G R A P H I C S • May 2018 • 41 This customer wanted a full wrap on the box but needed it to tie into the cab. A simple arch and darker background helped the primary information stand out. Secondary information was placed on the door. These graphics included an oversized logo and faded stripes, keeping the overall design simple and easy to read. ownership of the design. 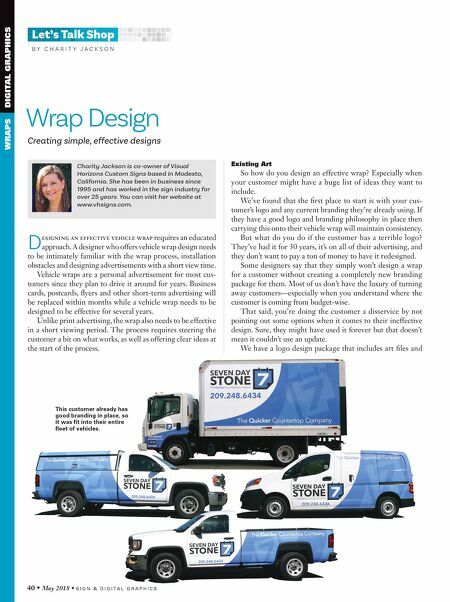 We also have design setup charges for our vehicle wraps. We have to measure and photo- graph their vehicle, typeset/font infor- mation, import provided art files, etc., which means there is going to be an art charge. We may not get the customer to bite on a complete logo design package, but they may be open to paying a little more for us to work a little magic on their existing logo. Plan a few extra hours into the design setup and give your customer this setup pricing up front. Once they agree to your pricing, and you've received a deposit, then spend a little more time polishing up their logo. Sure, it's not a complete branding package or a total redesign, but it is help- ing the customer. 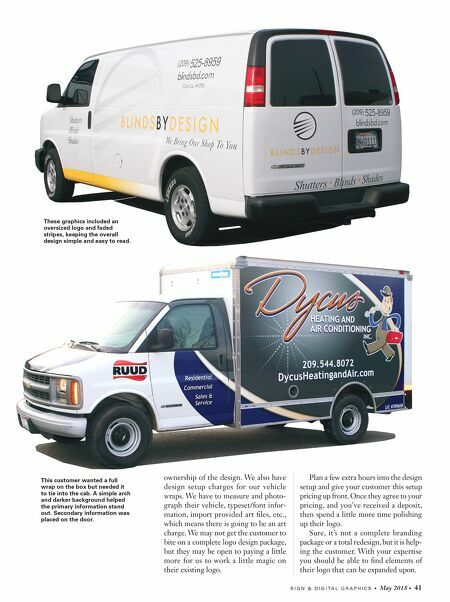 With your expertise you should be able to find elements of their logo that can be expanded upon.